With the increasing use of digital video recorders (like cable or satellite DVRs), there comes the question of what to do when their hard drives get full. You may be able to transfer your hard drive recordings to DVD, but there are some limitations. The physical process of recording from a DVR to a DVD recorder is the same as recording to a VCR, or a DVD recorder/VCR combo. In fact, your DVR or DVD Recorder user manual should have a page illustrating this. You can connect a DVR to a DVD recorder, provided the following connection options are available on your DVR. Connect either the S-Video or Yellow composite video outputs, along with the red/white stereo audio outputs of the DVR to the S-Video or Composite Video and the red/white analog stereo inputs of the DVD recorder. 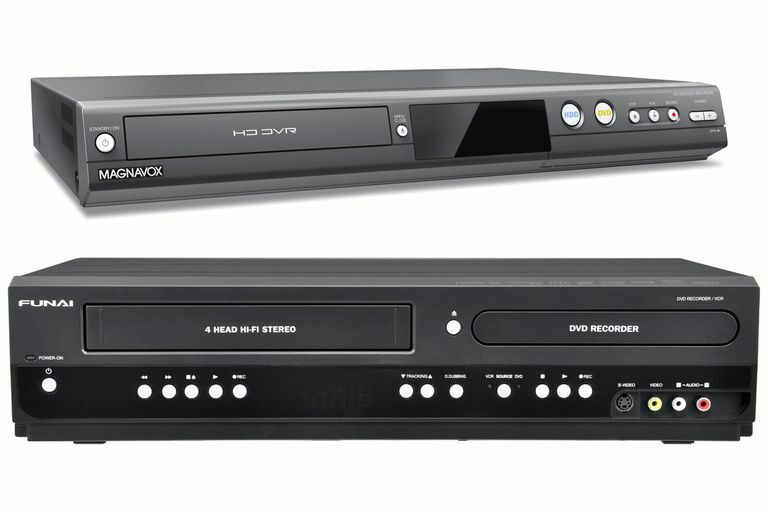 It is important to note that before you purchase DVD recorder or DVD recorder/VHS VCR combo that your DVR does have the connection options listed above. If your DVR only has HDMI outputs for video/video or HDMI for video and digital optical/coaxial outputs for audio, then you are out of luck as DVD recorders do not provide these as input options. In other words, it is necessary for your DVR to have analog video and audio outputs in order to connect to the corresponding inputs on a DVD recorder in order to be able to transfer video and audio signals the DVR to the DVD recorder and DVD disc. Even if your DVR and DVD recorder have compatible connections, another factor to keep in mind is that with some programs you may have recorded on your DVR, such as those originating from HBO, Showtime, On-demand program services, and even some non-premium channels, employ a type of copy-protection that allows an initial recording on a DVR, but will prevent that program from being copied further onto DVD or VHS. Since this is random, you won't know until you try it or take note of any copy-protection message before the program starts. If the DVD recorder detects a copy-protected signal, it will usually display a message on the DVD recorder's front panel and, possibility, eject the DVD disc. Read more on the increased use of copy-protection that may prevent transferring recordings from a DVR to a DVD recorder. If you want to transfer recordings that you have made on your DVR to DVD, here are the basic steps to follow. Check your DVR and see if it has the following connections: S-Video, Composite Video (yellow) and audio outputs (red and white). Check your DVD recorder for these same connections as input options. Connect the S-Video or Composite (yellow) video and red/white audio outputs of the DVR to the corresponding inputs on the DVD Recorder (labels may include—video 1, video 2, line 1, line 2, or AV-in, AV1, AV2—this labeling varies by manufacturer). Set the DVD recorder to the line or video input (line 1, line 2, video 1, video 2, AV-in, AV1, or AV2). Insert your blank DVD disc into the DVD recorder. Follow the playback and recording instructions for your specific DVR and DVD recorder. If the recording fails to start, you see a message on your TV that the recording cannot be made or that your DVD recorder is receiving an "unusable signal", recheck your connections. However, if everything is connected properly and you have followed the proper steps, you may be a victim of the copy-protection issue discussed previously. If you subscribe to HD cable/satellite services and have an High-Def DVR as part of that service, and you are successful in making a copy of your DVD recording onto DVD, that copy will not be in high-definition, as DVD is not a high definition format. What will happen is that the DVR will downscale the recording output to standard definition via the S-video or Composite (yellow) video outputs so that the DVD recorder will be able to record the signal onto DVD. If you are thinking that using a Blu-ray Disc recorder will allow you to make copies of your cable/satellite content in HD, it is also important to note that in the U.S. Blu-ray disc recorders are not widely available and those that are will not allow you to record any HD content from the DVR to Blu-ray Disc. In the heydey of VCRs and DVD recorders, we had a tendency to record a lot of TV programs and movies from antenna, cable, or satellite on tape or disc for later viewing convenience. However, in today's environment, official restrictions limit what you can record and what medium you can record onto. With the advent of options such as Video-on-demand and internet streaming, which allow watching a program or movie anytime you want, the need of having to record a favorite TV show or movie is greatly diminished. Also, when you take into consideration that all the recordings you make have to be done in real time, that results in a lot of time you have to spend making those copies. Consider how long it will take you to copy an entire season of a show from your DVR to DVD, such as Game of Thrones, combined with the fact that you end up with a lower quality copy of what you had on your DVR recording. Also, a question you should always ask yourself is "How often will I actually view what I copied to DVD". When your DVR hard drive gets full, do you really want to take the time to make DVD copies, or is there content you can delete in order to make room for more.